Featuring timeless images from the Papyrus of Ani and zodiac signs from the Temple of Isis, The Book of Days is designed to serve as a permanent record of important events in your life and the lives of family, friends, and loved ones. Use it to chronicle birthdays, engagements, weddings, graduations, and other significant milestones. This exquisite keepsake with three-quarter cloth binding and ribbon marker will become a history of your own unique experiences. As you personalize these pages, they develop into both a treasured history and your family legacy. 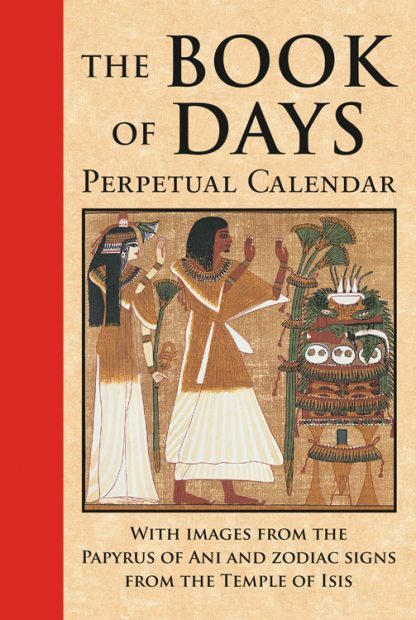 Images from The Book of Going Forth by Day also known as the Book of the Dead, an Egyptian papyrus painted some 3,500 years ago, are included in full color to accompany each week of the year. Thus, as you memorialize your own life�s events, you will share in the personal journey of an ancient scribe and his wife through the realms of the Egyptian Afterlife. Astrological signs from the Temple of Isis in Denderah are featured for each month.